We live in a world in which the news is full of senseless tragedies. From terrorist attacks, to school shootings, to random acts of violence. These tragedies can disturb and upset us. Often, we feel helpless, because there seems to be nothing we can do to prevent them, or to help the people affected by them. However, there is always one thing that we can do, and that is to remain calm, loving, peaceful and compassionate within ourselves. When we get upset, worried, angry, guilty or sad, we are not in a position to offer anything helpful to those around us. But when we cultivate inner peace regardless of the senseless tragedies in the world, we become a beacon of love and compassion to everyone around us. From this empowered inner state, we are much better equipped to respond effectively and appropriately to the suffering in the world around us. 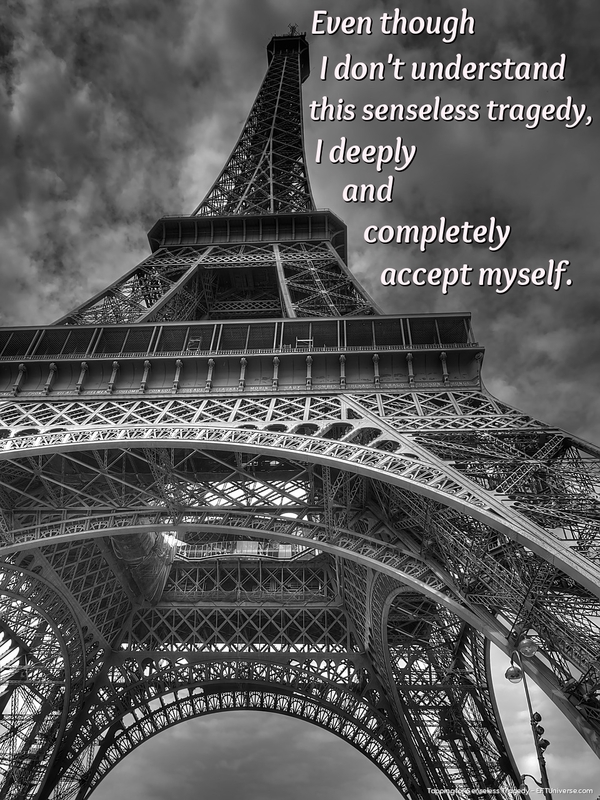 I wrote this tapping script to use when we feel emotionally overwhelmed by senseless tragedy. Tap through the points in any order that feels good to you. 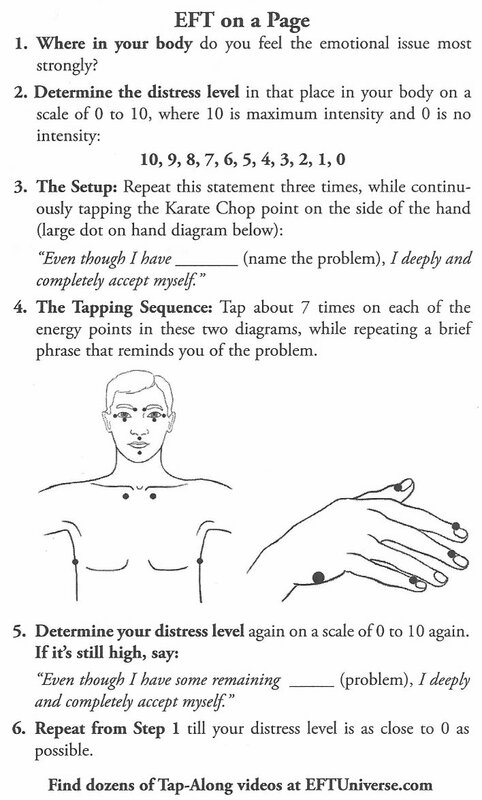 In the script, I suggest specific points to tap, but these are guidelines only, and you can pair tapping on any point with any of the affirmations. A tapping diagram appears below the tapping script. When you’ve used the script, please share your experiences with others. Use this link to Facebook to encourage and support other people who are struggling with these same issues. You are even more powerful when you share your strength! KC (Karate Chop Point): Even though I don’t understand this senseless tragedy. KC (Karate Chop Point): Even though I can’t believe people would do such a thing. KC (Karate Chop Point): Even though I can’t believe this is happening. KC (Karate Chop Point): I deeply and completely accept myself. EB (Eyebrow): I can’t imagine the things that happen in the world. SE (Side-of-eye): I can’t believe we live in a world in which such things are a possible. UE (Under-eye): Why would anyone do such a thing? UN (Under-nose): It doesn’t make any sense. CH (Chin): It doesn’t make sense to hurt other people. CB (Collarbone): It doesn’t make sense to cause such suffering. UA (Under-arm): It doesn’t make sense to cause such violence. KC (Karate Chop Point): And even though all this violence and suffering makes no sense. EB: It could have been me. SE: It could have been my family. UE: It could have been my loved ones. UN: It could have been my friends. CH: It could have been anybody. CB: All those poor people. EB: I can’t help them. SE: I can’t help myself. UE: I can’t help the ones I love. UN: I can’t protect anyone. CB: Can’t help any of them. KC: Can’t help the people I love. KC: And even though there’s nothing I can do. EB: Nothing I can do. SE: Nothing I can do. UE: Nothing I can do. UN: Nothing I can do. CH: Nothing I can do. CB: Nothing I can do. UA: Nothing I can do. KC: Nothing I can do to help those who are suffering. KC: I deeply and completely accept myself. EB: I now send love from my heart. SE: To all those who are suffering. UE: As a result of this senseless tragedy. UN: I now send love from my heart. CH: To all the people in the whole world who are suffering. CB: I now send love from my heart. UA: To all the people I know. EB: All my friends and all my family. KC: I now send love from my heart. SE: To the parts of myself that are suffering. UE: To the parts of myself that are violent. UN: To the parts of myself that are senseless. CH: To the parts of myself that cause harm. CB: That cause harm to myself and others. KC: And even though I’m not perfect, I deeply and completely accept myself. EB: I don’t know why this tragedy happened. SE: I’m powerless to do anything about it. UE: I can’t even understand it. UN: And even though I am unable to understand it. CH: And even though I am unable to help. CB: And even though I can’t do anything. UA: And even though I’m helpless. UE: I can’t help anybody. KC: And even though I’m helpless, I deeply and completely accept myself. KC: Is not going to help anybody. SE: Is not going to help anybody. UE: By being angry and upset. UN: I’m adding to the anger and upset in the world. CH: I choose now to release it. CB: I choose now to release my own suffering. UA: I choose to be at peace. KC: Despite this terrible tragedy. KC: I send peace and love from my heart. KC: To everybody suffering now. KC: To my own suffering mind. KC: To the whole world. KC: I choose to be at peace. EB: I use this terrible tragedy. SE: As a reminder of how important it is for me to be at peace. UE: As a reminder to be a person of peace in the world. UN: No matter how violent that world is. CH: I choose to be a person of peace. UA: I choose to be a person of love. KC: I choose to be a person of kindness. KC: I choose to be a person of peace, love, and kindness. EB: I resolve that every thought I think. SE: Will be nothing but peace and kindness. UE: I resolve that every feeling in my heart. UN: Will be nothing but compassion and love. CH: Filling myself now with compassion, love, peace and kindness. CB: I send that energy out into the world. UA: To touch and heal everyone. KC: I am a powerful creator. KC: I have powerful energy. KC: And I now send that powerful energy out into the world. KC: To touch everyone else with peace compassion and kindness. EB: That is what I can do. SE: This is in my power. UE: I may feel powerless. UN: In the face of this senseless tragedy. CB: To send the energy of love out into the world. KC: I have the power. KC: To create peace and love in my own heart. KC: In my own body. KC: In my own energy field. EB: I now claim my power. SE: To create peace and love in myself. UE: And send those intentions out into the world. UN: I am a powerful creator. CH: And I choose to use my creativity. CB: To create peace and love all around me. UA: No matter what else is happening in the world. KC: And no matter what choices other people make. KC: My choice is clear. KC: I have made my choice. KC: And my choice is to be a person of peace and love. KC: In my own mind, my own body, and my own energy field. EB: I radiate peace and love all around me. SE: Despite this senseless tragedy. UE: Despite all the tragedies in the world. UN: I choose to be a person. CH: Of peace and love. CB: I choose to be a beacon. UA: Of peace and love. KC: I choose to be a person. KC: Of compassion and kindness. EB: No matter what choices everybody else’s making. SE: Only I choose how I feel. UE: Only I choose the kind of person I am. UN: And I choose to be a person of love. CH: I choose to be a beacon of kindness. CB: I choose to be a person of compassion. UA: I fill my own heart with compassion. KC: I fill my own body with compassion. KC: And I fill my own mind with compassion. KC: I walk into this day as a beacon of love and compassion. EB: Kindness is not weak. SE: Compassion is not weak. UE: Peace is not weak. UN: Compassion is stronger than fear. CH: Kindness is stronger than violence. CB: Peace is stronger than any tragedy. UA: Love is stronger than fear. KC: And as a person of love, peace and kindness. KC: I walk now into this day. EB: My heart is at peace. SE: My mind is at rest. UE: And I am strong.